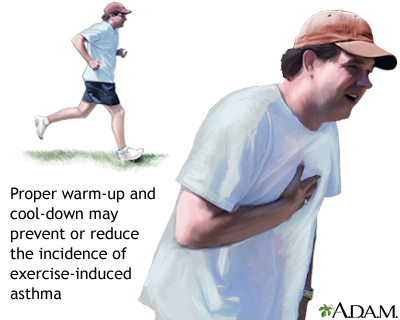 Sometimes exercise triggers asthma symptoms. This is called exercise-induced asthma (EIA). The symptoms of EIA are coughing, wheezing, a feeling of tightness in your chest, or shortness of breath. Most times, these symptoms start soon after you stop exercising. Some people may have symptoms after they start exercising. Having asthma symptoms when you exercise does not mean you cannot or should not exercise. But be aware of your EIA triggers. DO NOT exercise when the air is polluted. DO NOT exercise near fields or lawns that have just been mowed. Swimming is a good sport for people with EIA. The warm, moist air helps keep asthma symptoms away. Follow your doctor's advice on which medicines to use and when. Weiler JM, Brannan JD, Randolph CC, et al. Exercise-induced bronchoconstriction update - 2016. J Allergy Clin Immunol. 2016;138(5):1292-1295.e36. PMID: 27665489 www.ncbi.nlm.nih.gov/pubmed/27665489.